A member of the B.C. 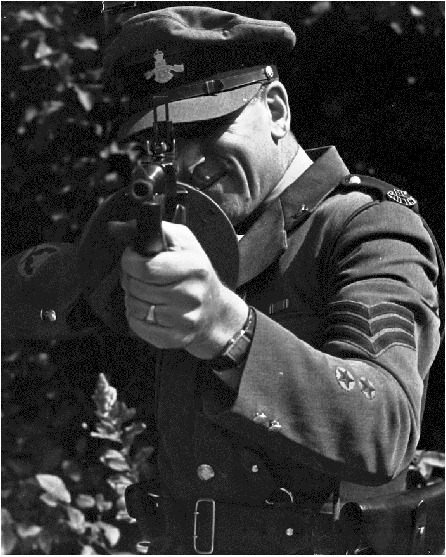 Provincial Police takes aim with a tommy gun. The force, older than the RCMP, policed the colony and then the province from 1858 until 1950. BC Archives B-06995. Eric Hallam is one of the last surviving members of the force that policed this province for nearly a century. The remaining veterans of the British Columbia Provincial Police muster on the second Tuesday of every month for lunch at a Greek restaurant in Langley. Once, the police force patrolled mountain highways in radio-operated squad cars. It even boasted a navy of vessels to scout smuggler’s coves. 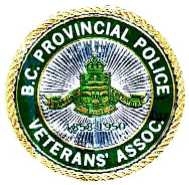 The BCPP was disbanded in 1950 when the RCMP took over policing in the province. Ever since, voices are raised every few years to suggest the Mounties be replaced by a revived provincial police force. When federal Public Safety Minister Vic Toews recently said B.C. had until November to accept a new 20-year deal or face withdrawal of RCMP services by 2014, Premier Christy Clark countered with the possibility of striking a new provincial police force. Mr. Hallam is one who does not think the RCMP will be leaving anytime soon. A constabulary was formed at Fort Langley with the founding of the colony of British Columbia in 1858. The authorities were eager to police a flood of pistol-packing gold prospectors from California. Over the years, the provincial police did battle with naked Doukhobors and chased rumrunners through coastal waters. Forbes Cruickshank, an inspector with the BCPP, became famous for solving the mystery of the Beryl G, a vessel found abandoned with her decks specked by bloodstains. The owner and his son were missing. Having a hat and a camera as clues, the inspector tracked down Harry Sowash and Owen (Cannonball) Baker, who were hanged for murder. It could be dangerous work. John Ussher, a constable, was shot to death in 1879 while persuing the notorious McLean brothers, outlaw horse thieves. Seven years ago, Mr. Hallam, the longtime president of the BCPP veterans’ association, came to Victoria for the official unveiling of The Bastion, a monument on the grounds of the Legislature honouring police killed on duty. Among those named are 14 members of the BCPP. Few in attendance knew Mr. Hallam came within a knife tip of being No. 15. Born in Armstrong, he moved with his family to the Fraser Valley, where his parents ran a dairy farm. He did not care for milking cows with their manure-encrusted tails, so ran away from home on his 17th birthday to enlist with the Royal Canadian Navy as a boy seaman. He served on North Atlantic convoys and fished the bodies of Allied soldiers from the English Channel following D-Day. After the war, he returned to Canada, joining the provincial police at age 21. He was posted to Prince Rupert, Ocean Falls and Bella Bella, and sent to the Kootenays at a time when the Sons of Freedom sect of Doukhobors were burning buildings in protest. “I remember sitting up at nights in schools to prevent them from getting blown up,” he said. In 1950, just a few weeks before the provincials were to be disbanded, he was ordered to join two other constables and a doctor in taking into custody Stanley Thacker, a 32-year-old man suffering from schizophrenia. “I got five holes in me that night,” he said. The constable got stabbed in the back and the left arm, the shiv puncturing a lung and the outer edge of his heart. One headline in an American newspaper the next day read: Police constable fighting for life. “I should have died,” he said. He survived, as did Mr. Thacker, who recovered after being shot in the abdomen by the officer. 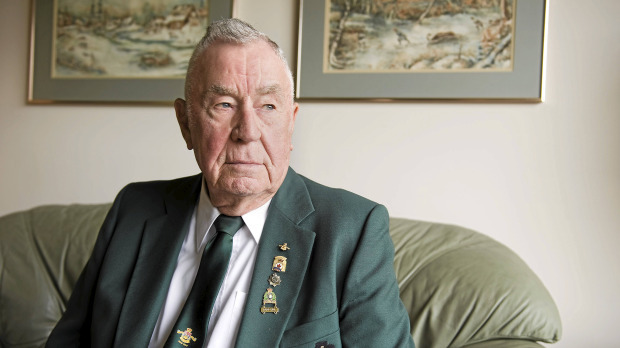 When the 520-man provincial force was disbanded 10 weeks later, Mr. Hallam was one of the few not to join the RCMP, as the force wanted him to sign a waiver clearing them of future responsibility for lung or heart troubles. Instead, he joined the city police force in New Westminster, retiring as acting chief constable of the West Vancouver police. After taking over policing in the province, the RCMP took a stash a weapons — including 49 revolvers, 15 automatics and four Great War-era machine-guns — and dumped them at sea. The Mounties also destroyed a quantity of B.C. Provincial Police badges and other insignia. 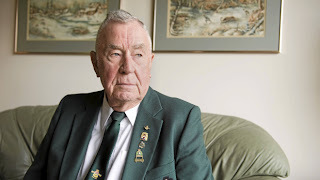 It has fallen to Mr. Hallam, 85, of Chilliwack, and his diminishing band of veterans to keep alive the memory of a force that policed the province for 92 years, from the gold-rush days to when a young constable nearly lost his life to a knfe-wielding man. Thank you Tom. The man you have used in this article is my grandfather, and i am more than proud to call him so. Few people know the story behind the BCPP, and fewer yet understand how my grandfather feels. I hope this article brings to light what a great police force BC had befor the RCMP came to town. My adoptive father as a member of the BCPP also. He died in 1968 and would be about 112 years old if he was still alive.